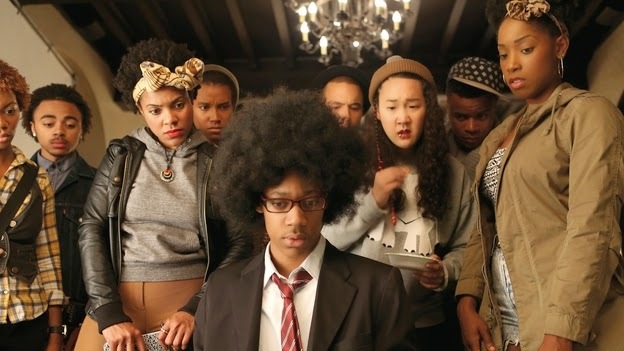 DEAR WHITE PEOPLE wants to be a lot more clever and funny and provocative than it actually is. Which puts me in mind of the ancients who decreed that satire is truly the most difficult of the comic forms to pull off well. It requires political insight, comic timing and the ability to be disciplined about maintaining a tone of angry detachment. And to be sustained over the length of a feature film you truly need an exceptional script. There are hints of this in the movie we are presented with. There are scabrous one-liners, usually uttered by the heroine (should satires have a heroine?) - a mixed race college student who identifies as stridently black as the film opens, and runs a campus radio show called Dear White People. But the director Justin Simien cannot sustain it. Too often, rather than truly pushing the envelope into provocation he softens his characters at a crucial moment or descends into schmaltz. For example, take the character of Coco, a black girl who straightens her hair and dresses in what she perceives to be a sophisticated white manner. She’s willing to do anything for success via her youtube channel and a potential reality TV show, even if that means being instrumental in organising a fancy dress frat party that sees white people put on blackface. In a movie like ELECTION or TO DIE FOR that kind of ambitious, ruthless character would’ve been pushed to frightening extremes, but Simien balks at the last minute - he can’t quite let her be truly horrific. No, that’s a fate he saves for his rather lazily racist white kids. Similarly, the story of a mixed race girl struggling over whether to identify as white or black could’ve been fascinating - but should this satire be saddled by an attempt at deep emotional drama, as she confides all her insecurities to her cute white boyfriend? Spoiler alert, but any satire that ends with a cute multi-racial couple holding hands in a sun kissed park is really jumping the shark. By far the most interesting character is actually a skinny smart black kid called Lionel with a massive afro. He’s gay and like Bergman so he doesn’t fit it in any of the frat houses. He gets many of the best lines, but isn’t really allowed to have the punchline, which is a great shame. As an English viewer I’m not really sure what to make of this film. It seems to require a knowledge of, and maybe a frustration with, the organisation of American universities and American race relations that, perhaps thankfully, I find rather bizarre and hard to understand. But there it is over the end credits - real kids in real colleges blacking up for parties. So this kind of film is deeply necessary. But it was too ambitious for this director to tackle with this script. Worse still, his arch framing of scenes, complete with chapter titles seems a weak derivative of Wes Anderson, and his use of a classical score simply odd. DEAR WHITE PEOPLE has a running time of 108 minutes. DEAR WHITE PEOPLE played Sundance and London 2014 and will be released in the USA on October 17th. It won the Special Jury Prize Dramatic at Sundance.